Definition at line 585 of file llviewerobject.h. 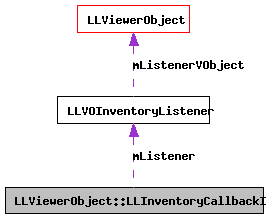 Definition at line 4664 of file llviewerobject.cpp. Definition at line 590 of file llviewerobject.h. Definition at line 589 of file llviewerobject.h. Referenced by LLViewerObject::registerInventoryListener(), LLViewerObject::removeInventoryListener(), and ~LLInventoryCallbackInfo().